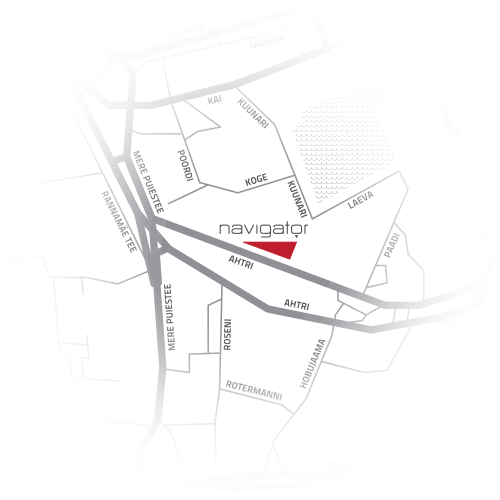 Navigator is easy to find – the building is located in the centre of Tallinn, on Ahtri Street (Laeva 2), in the port area, which will develop into a lively city centre in the next few years. In the vicinity of Navigator there are contemporary shopping and commercial buildings and residential premises – Rotermann Quarter, Hotel Euroopa, Foorum and Norde Centrum shopping centres, the port’s passenger terminals, etc. Within a few minutes’ walk are the Old Town, the commercial and shopping area of the city centre, cultural centres, spas, dozens of cafes and restaurants. There is a bus terminal on the ground floor of Viru Centre and the port’s terminals are even closer. Balti Jaam is also close by, providing a good rail link to the rest of Estonia. The drive to the airport from Navigator takes about 10 minutes. There are streets on each side of the building, making access to the building easy and convenient and increasing the distance from surrounding buildings.